Dr Ian Parker Heath of Enrichment through Archaeology will give an illustrated talk on the archaeology and pre-history of Buxton and its surroundings before the arrival of the Romans. The illustrated talk will be held at Poole's Cavern Visitor Centre on 22nd October, starting at 7.30pm. Members and non-members welcome. Ian graduated from the University of Southampton in 1999 with a degree in Archaeology. During this time he gained valuable experience of working on a number of excavations of Neolithic sites in the Southwest of Scotland directed by Julian Thomas, including the cursus monuments at Holm and Holywood. Subsequent to his undergraduate degree, Ian undertook a PhD at the University of Manchester under the supervision of Dr Tim Insoll and funded by the AHRB. Following a long standing interest, the subject of this research was ‘The Representation of Islam in British Museums’. During this period, Ian also took part in buildings surveys in the West Bank as a team member of the Medieval & Ottoman Survey, a project supported by the British Academy. An edited version of his PhD was published by BAR Archaeopress in 2007. 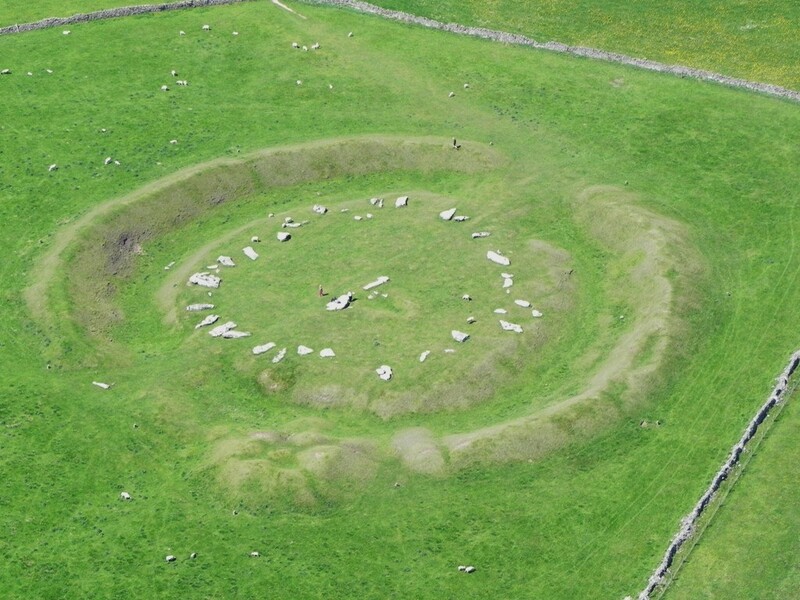 Ian has also continued to work on Neolithic sites: he worked on the Dunragit Project (1999-2002), the excavation of a substantial palisaded and pit defined cursus monument near Stranraer; and between 2004 and 2009 he was a supervisor on the Stonehenge Riverside Project, working with Prof Julian Thomas on Durrington Walls, the Stonehenge Cursus and the long barrow, Amesbury G42. For the past 2 years he has been working with Prof Thomas on sites in Herefordshire. Ian also has in interest in teaching, having taught a number of Archaeology courses at the University of Derby College Buxton. He has a wide-ranging knowledge of the archaeology of the Peak District having run guided tours in the area. Members may be interested in a forthcoming illustrated talk to the Friends of Buxton Museum, at 7pm on Friday 25th September, at the Museum. 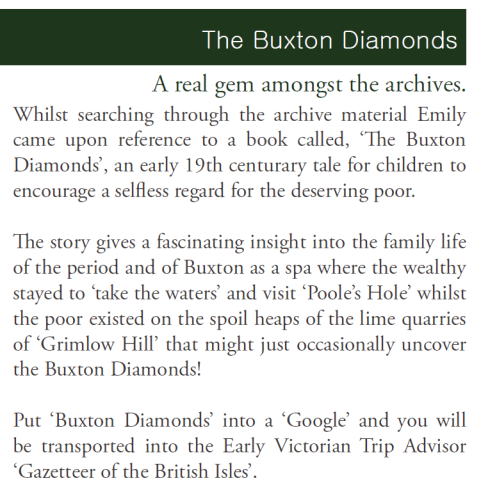 The theme of the talk is “Buxton Diamonds”, which were mentioned in our Autumn 2014 Newsletter (see photo above). The talk is being given by Roy Starkey who has been researching the history of these interesting crystals over the past five years and a paper describing his findings will be published in the Journal of the Russell Society at the end of this year. The talk will review the fascinating history, geological context and mineralogy of the crystals, illustrated with surviving specimens from museum and private collections. There is a small charge of £3 for non-members, and refreshments are served after the talk. Buxton Civic Association hosted an International Speleothem Summer School at Poole’s Cavern Visitor Centre during the last week in August. Speleothems are mineral deposits formed from groundwater within caverns. Stalagmites, stalactites, and other forms may be annually banded or contain compounds that can be radiometrically dated. 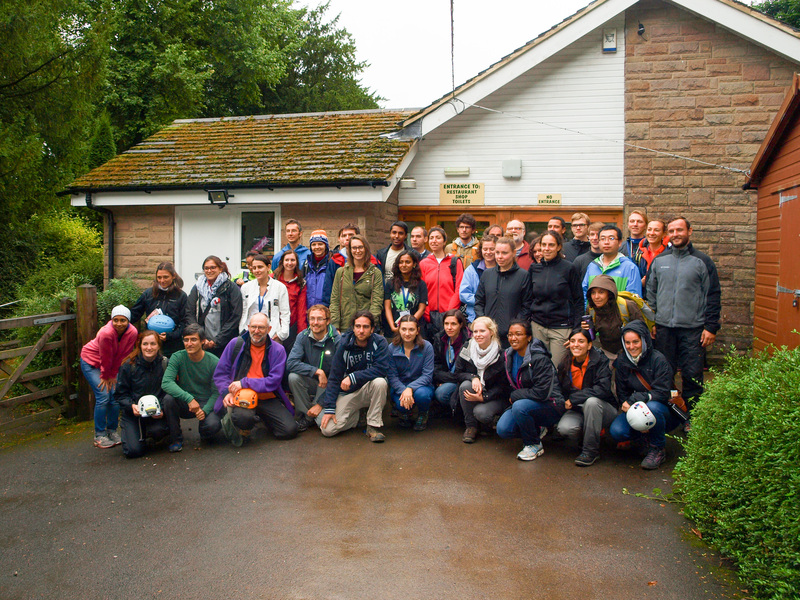 Using Poole's cavern as a base, the conference was aimed at researchers studying stalagmite growth and atmospheric changes in caves around the world and how climate change patterns can be recorded and analysed. The conference hosts included Prof. John Gunn and Prof. Ian Fairchild who led seminars and field trips around the cavern and surrounding Limestone hills. Delegates included experts from as far afield as Russia and Spain as well as Birmingham University, Oxford and Royal Holloway. Heritage Open Days are an opportunity for free access to some of our nations hidden gems. Many unique and undiscovered historical sites around the country will be throwing open their doors for free over this 21st Heritage Open Days weekend. With Buxton joining in again this year, it will be a great opportunity to see some rare sights of Buxton. The Old Hall Hotel will be offering in conjunction with Netta Christie, Director of Discover Buxton Tours some interesting insights into our heritage.